High in the misty foothills of the Ōu Mountains in Japan, built on the grounds of an ancient temple, stood a one-room curator’s house that was crafted out of stones excavated from the mountainside. A 200-year-old rose bush clung to its southern wall, dotting the stonework with thorny canes and yellow blossoms. Inside the dwelling, the morning sunlight peeked through a gap in the faded cotton curtains, the warm rays fell over the futon where a man and woman lay together. The man, a Native American named Billy White Smoke, had made his living by working construction and odd jobs back in the States until he ventured across the ocean to find the woman beside him. Her name was Haruto. She was an Earth Sentinel, like Billy, but also a Miko like her mother, grandmother and great-grandmother before her—a tradition dating back thousands of years to when female shamans mingled with Japan’s ruling class, acting as healers, mediums and ritual dancers. Her flowing black hair, tinged with a few grays, was sprawled across the pillow. Billy held her close, kissing her forehead before rubbing her pregnant belly with his calloused hand. Billy hesitated, then said, “I was thinking, before the baby comes, we could get married.” He waited for her response. He turned away, lying on his back, clasping his hands behind his head, trying to remain calm. Billy wasn’t happy at where the conversation was ending, but he was old enough to know you have to pick your battles, so he said, “Fine, I’ll walk with you.” He flung the duvet off himself, getting out of bed to rifle through his clothes piled on top of the dresser, putting on a pair of work jeans and a black t-shirt. He grabbed his black-brimmed hat decorated with silver conchos and turquoise from a peg on the wall, placing it on his head, adjusting it to make sure the tilt was just right. Haruto snatched her scarlet-colored silk pants off the chair in the corner, pulling them on, wrapping the ties around her protruding stomach. She looked forward to this small act every morning. It helped her to measure the baby’s growth as the pant ties seemed to become shorter and shorter with each passing day. She let the white silk blouse fall over her head, sliding her arms through the draping sleeves, leaving the hem untucked so it would fit over her rounded belly. Ready to face the world, the couple stepped out of the house. Billy closed the red-painted door behind them. They strolled along one of the stone paths that meandered through the meditation garden filled with bonsai, cherry, apple and pear trees; lavender; wisteria; and cultivated roses. Startled, Haruto glanced back at him, then followed his gaze, solemnly noting the unusual plane trails. “Was it all for nothing?” she questioned. He gave her a reluctant smile. Haruto stretched out her hand, opening Billy’s clenched fist, slipping her fingers between his, leading him through the garden toward the temple. “Everything looks wonderful,” she complimented him, hoping to brighten his mood. Billy was being modest. He had transformed the neglected garden into a thing of beauty by reinvigorating the trees, resetting the stone paths, and patching the numerous steps that had become hazardous. His favorite improvement was the addition of medicinal herbs that were planted throughout the grounds, which introduced an element of untamed wildness, and balanced the vibrational qualities of the landscape. They moved toward the ancient temple at the forefront of the property, which faced the road at the bottom of the foothill. The building stood three-stories tall and had originally been built for Buddhist monks, who had abandoned the place due to a lack of parishioners and dwindling financial support. Its distinct gabled roof was a combination of Chinese and Japanese architectural styles, which, at one time, were used exclusively for those in power. The feudal lords had forbid farmers and commoners from copying it—one of the many tactics they had utilized to maintain their authority. The couple stopped at the rear of the temple. Here, steps led to an expansive landing that supported a wooden pergola holding an enormous bell—seldom rung these days. Haruto faced Billy. “See you tonight,” she said, standing on her tiptoes to give him a quick peck on the lips. Two Mikos, who happened to be strolling along a nearby path, gave them disapproving glances. Most of the women here had not adapted to Billy residing on the grounds, despite the passing years. Men traditionally weren’t allowed to live with Mikos. But in Billy’s case an exception had been made, allowing him to dwell in the curator’s house in exchange for his gardening and maintenance services. This exception spoke of Haruto’s status—one that had risen considerably after her participation in the Earth Sentinels’ group. She went inside the temple, passing through the foyer and bypassing the stone staircase that led to the upper floors. Haruto entered the common area where a few Mikos mingled with the city dwellers, who wore workout clothes and held rolled mats while they waited for the yoga class to begin in the Great Hall. A plastic banner with the words “Sign Up for Yoga Classes” hung above the fireplace mantle, but it seemed out of place in this age-old building. On a narrow table, pressed against the wall, were jars of honey for sale. “Yes, please.” Haruto always enjoyed a visit from the local Geki—the male version of their sect. But her anticipation was squashed when a young Catholic priest strolled around the corner. The Japanese man wore the traditional black robe and white collar, and held a Bible in his hand. The gold crucifix hanging from his neck was centered over his heart. His eyes glanced at Haruto’s pregnant belly. If he held any judgments, he concealed them well. Haruto hid her displeasure at what she considered to be an intrusion, mostly because she assumed that he was here to convert her as so many others had tried before. She politely bowed. “The pleasure is mine. How may I help you?” Being polite was the Japanese, and Miko, way. “Yes, I also am familiar with the Miko tradition,” countered Father Chong who, after glancing at her bulging stomach, mentioned, “but I wasn’t aware that Mikos were allowed to marry.” His words were meant to demonstrate his knowledge of their traditions, not insult her. “Oh.” The priest was not sure how to respond. She moved toward the entrance, encouraging him to walk beside her. As they passed by the table displaying the honey, she picked up a jar, handing it to him. “My gift to you.” This token offering allowed Haruto to feel that she had repaid Father Chong for the Bible—and thereby released her from all obligations to meet with him again. He had touched on a topic they could both agree on. “It’s Haruto.” She politely bowed. Later that evening, dark storm clouds gathered in the sky. The wind howled through the trees, forcing the limbs to dance manically. Haruto and Billy were having dinner inside the curator’s house. They sat at the small table next to the window whose handcrafted glass panes had been rippled by time. Candles lit the room. She quietly chewed her food. A gust of wind rattled the window. The candles on the table flickered. Outside, the mounting storm tore leaves and twigs from their branches, hurling them through the air. A barn owl crash-landed on the windowsill. Its golden-rufous breast thumped against the glass. Haruto gasped, startled by the bird’s sudden appearance. Unharmed, the owl righted itself, struggling to maintain its perch as the wind ruffled its brown plumage accented with orange-tan spots. The bird of prey focused its eyes on Haruto, who felt honored. Owls were considered bearers of good luck in Japan. However, Billy did not have the same reaction. In his Native American culture, an owl was an omen of an impending death or tragedy. He felt a strong desire to stand between his lover and the night hunter’s line of sight, even as he knew he couldn’t save her from the harbinger’s premonition. The downpour pelted the bird as it stared at Haruto through the rain-streaked window. Its strange unrelenting gaze caused an unexpected fear to arise within her. Lightning ripped through the turbulent sky. Thunder exploded. The barn owl screeched, then flew away, disappearing into the ominous darkness, leaving the man and woman with a sense of dread they couldn’t quite name. “Of Stars and Clay” New Release! I spent the last two years researching and writing my new novel Of Stars and Clay (Science Fiction & Fantasy, Dystopian). I read Zecharia Sitchin’s seven volumes in the Earth Chronicles set, translations from Sumerian tablets and numerous books, such as those by Stewart Swerdlow and Divid Icke. Within a few months of my research, I saw orbs in the sky (you can read more about this in my blog post). The orbs’ presence confirmed for me there is an alien/extraterrestrial presence here on earth—meaning that some of the conspiracy theories were true. But which ones? Were the elite (royalty/Rothchilds) really part reptilian? Were our governments being ruled by a secret force behind the scenes? And if they were, who or what was this secret force? And what was their agenda? In Of Stars and Clay, I imagined how those conspiracies might play out. So, once again, the Earth Sentinel characters come together under the guidance of Bechard the fallen angel—only this time it’s to save mankind from a dark force that not only threatens our bodies, but our souls. Of Stars and Clay ebook is on sale for only 99¢ until December 26. The first book, Earth Sentinels: The Storm Creators is also on sale. Below are questions to help get the conversion started at your book club or group. General questions are provided at the end. The author asks the reader to believe that a virus can be spread through the use of planes. Many conspiracy theorists believe the government, or a secretive government/power, has been spraying our skies since the 1960s for different purposes, such as geo-engineering and/or dispersion of chemicals that can alter the human mind. Do you think it’s possible to spread a virus around the globe in one day? How does the fishing episode convey the relationship between Zachary and Takwa (the rival hunter)? Or Zachary’s relationship with the tribe? What does Haruto’s reluctance to marry Billy tell you about her and her relationship with him? How does Haruto and Father Chong’s interaction at the temple set a precedence for the rest of the novel? The owl that appears outside the curator’s house signifies different things to Haruto and Billy. For you, does the owl offer wisdom or luck? Or bring an omen? Or something else? One strange example of the owl’s meaning is found within the secretive Bohemian Society. Its members include the top 1% of the 1% (illuminati) as well as leaders, influencers and past US presidents, such as Richard Nixon, Gerald Ford, Ronald Reagan, and both George H. W. Bush and George W. Bush. The Bohemian Society members don a priest costume and worship the forty-foot-tall Great Owl of Bohemia statue while standing near a bonfire and burning coffin. Their motto is “Weaving Spiders Come Not Here” (How does this motto play out in Chapter 3?). This men-only event takes place each July in Northern California. Tom tells a story about the spider that spins webs to keep the stars in place, but she lost a star and went after it. In her absence, a sneaky spider took control. What did each spider represent? Was the missing star symbolic of someone or something else? Does Conchita overreact to the death of her son and father? When the Blue Morpho butterflies rest on Eva, does it make you wonder if she has special powers, or really is a bruja (witch)? Eva sees the best in people, despite what is going on around her. Her own mother, Conchita, isn’t “available” to her during this time, yet her father’s love seems to fill the void. Are Eva and Zachary an analogy of the relationship between earth (feminine) and God (who is often represented as a father figure)? The anaconda communicates with Eva, then allows her father to live. Why? Was it plausible? When Haruto rings the bell to warn the Mikos of the soldiers approaching the temple, do her actions inflame the situation? Or would it have played out the same? Bechard the fallen angel appears for the first time. Judging by Billy and Haruto’s reactions, what kind of relationship does this couple have with him? The soldiers inject Haruto and Billy with electricity and sedative, and then drag them away from the temple. If the soldiers understood the underlying factors would they have acted differently or still followed orders? Is it believable that the UN leaders could so easily take control of the Japanese soldiers? Was there anyway that Haruto could have escaped before being taken to the underground alien’s headquarters? Zachary and Eva are outcast from the tribe. Is this symbolic of being cast out of the Garden of Eden, especially after being bitten by a snake? Eva convinces the jaguar to save Takwa. Should she have? The caiman’s presence is interpreted by Zachary as threatening, yet it only wants to rescue them. What does this say about perceptions? Does Pahtia’s earlier prediction that he would reincarnate as a caiman lead you to believe he is the caiman that helps Zachary and Eva? Is the trauma that Haruto experiences at the hands of the hybrid soldiers and alien scientists worth the prompting of her DNA mutation? Would her DNA have mutated anyway? The strange windstorm prevents Haruto’s presence from being detected by the soldiers, who are patrolling the city when the flying dirt disables the electronic tablet. Do you think the windstorm was a natural occurrence? When Haruto visits Father Chong at the parsonage, he opens up his home to her. Should she have been honest with him about trying to escape from the soldiers? When Zachary is discovered by the missionaries on the shore, he is near death, yet, with their help, he recovers. Why does the author keep introducing people who follow very different belief systems to each other? Bechard enlists shamans from around the world to send healing energy to Zachary, which brings him back to life. Is the resurrection symbolic? Why doesn’t the fallen angel do it himself? The Bear Claw First Nation tribe members being taken as prisoners by the soldiers is eerily reminiscent of when the Native Americans were imprisoned on the reservations in the late 1700s through the early 1900s. Is the author making a connection? Father Chong and Haruto seem to have a good relationship after spending time in each other’s company. What is the author saying about tolerance? Haruto transforms into an invisible state when she hears the soldiers storming through the priest’s house towards her. Does every great transformation take a traumatic event for it to occur? When Haruto learns she can transform herself, she believes herself to be invincible. Does this mean she has become immortal? In addition, clay is mentioned in the Bible: “But now, O Lord, You are our Father, we are the clay, and You our potter; and all of us are the work of Your hand.” – Isaiah 64:8. Clay is also in the title of this book. How is clay symbolic of birth and rebirth? The main characters seem to have little in common with each other—all from different backgrounds and cultures. What do they have in common? Bechard explains mankind’s origins to the Earth Sentinels. What parts of his explanation do you believe to be true: Ancient astronauts, genetic engineering, aliens/hybrids living among us, soul extraction, Illuminati? The Earth Sentinels have acquired amazing powers, yet know very little about them. If you discovered you had these powers, what would be the first thing you practiced? In Paris, Tom and Cecile discover that the blue-eyed people are holding office jobs and living in apartments, compare that to the brown-eyed people who are living in detainment camps and working in the mines. The blue-eyed race’s tendency to become hybrids who are fully connected to the hive mind is highly desirable to the Dracos. Do you think it’s possible that real-life royalty and some races’ protection of their bloodlines could possibly be an attempt to retain as much blood of the “Gods” as possible? The wife at the bar tells the younger woman that the UN has “discovered” who spread the virus, yet the UN organization is run by the Dracos’ hybrids (classic false flag). Is the author alluding to any other modern-day false flag events? Haruto and Zachary discover inner earth. Is this place physically possible? The Galactic Council speaks of the Law of Oneness: “Many people have pre-planned their destinies so however we proceed must honor that, even if it seems cruel, even to them. We don’t want to Interfere.” Does this mean that they can’t directly help people? Is that why the need the help of the Earth Sentinels? When John is scanned by the UN leader’s electronic tablet, the label “Level 4” comes up, and the man is sent to a work camp. What do you think is the criteria for “Level 4”? Do you think the military jets were sent in response to the tribe members being taken from the detainment camp? Or were they bombing all settlements? Would human soldiers be willing to bomb their own countryside? John is bussed to a food processing plant where he is told he will be employed. Why do the hybrids guide the unsuspecting victims through the “employment” process in a civil manner instead of handling them more roughly? Haruto’s “tour” through the aliens’ headquarters gives her insights into their prison system, genetic experiments and military structure. Is this valuable information for understanding what is going on behind the scenes? Does it help you to better understand the Dracos? Zachary and Billy reunite after being apart for five years. What kind of relationship do you think they had in the past? Of all their options, Tom and Cecile choose teepees instead of houses or mansions to bring to inner earth for their tribe members to live in. What does this say about them? Why were the Mikos so resistant to Haruto’s invitation to live with her in inner earth? Was Haruto too blunt when informing Father Chong about the aliens and their control over religion and society? What do you think about Haruto’s explanations when she used biblical references to support her claims? Was the Destiny Stone worth forming an alliance with the fallen angels? It was a very thin line using the fallen angels as assassins, as opposed to the Earth Sentinels doing it themselves (assuming they would). Do you think the Earth Sentinels crossed the line? Are the chest and Destiny Stone symbolic of anything else? What insights to Bechard’s personality do you gain from his interaction with the fallen angels’ ruler, Abaddon, who happens to be his cousin? Do you think Abaddon has a hidden agenda? What about Bechard? Zachary, Tom and Cecile agree to transport the fallen angel assassins to kill the Dracos. Zachary obviously has reservations. Should he have followed his heart instead? Do you think it’s possible for the Destiny Stone to hurt Haruto? Should the Galactic Council and/or fallen angels have known that the Dracos would still control the hive mind even after their deaths? At the end of the chapter, Abaddon tells his soldiers he will “unleash hell”. Do you feel his words are figurative or literal? Should the Earth Sentinels and Galactic Council have been more aggressive in their attacks? Although Bechard doesn’t claim to be leader in this scenario, he plans the EMP attacks. Why does everyone listen to his counsel? Would you have used the EMPs to attack more than the military bases? Tom uses an EMP device to disable the human armies’ planes, which ends up killing the soldiers who are invading Hagsmar. Did Tom make the right choice? Can Haruto justify following her heart during such dangerous times? What does Billy’s support of Haruto’s difficult decision say about their relationship? This is the first time in the story that you meet the other Earth Sentinels, who are indigenous healers and spiritual leaders from around the world. What insights does this give you into the main characters and Bechard? Was killing the UN hybrid leaders necessary? Was there a better way? Do you think the Seven Wonders of the World mark the earth’s sacred vortexes (Colossus of Rhodes, Great Pyramid of Giza, Hanging Gardens of Babylon, Lighthouse of Alexandra, Mausoleum at Halicarnassus, Statue of Zeus at Olympia, Temple of Artemis at Ephesus)? Do you think it’s possible that the earth has an energetic grid? Mari decided to save herself, but only after nearly drowning. Do we have to let go in order to move forward? Was Conchita’s excuse for not being with her family when they were thrown out of the tribe good enough? Takwa taunted Zachary, saying that his daughter, the bruja, wasn’t there to save him, yet it was the other way around—Takwa needed the little girl’s protection. How does this analogy play throughout the story? Abaddon is waiting for something to come through the tunnel. Any ideas on who or what it could be? Will the bio-crystals growing inside humans (making them living antennas) provide the solution that the Dracos need? Do you think earth’s rising vibrations are going to fulfill the Earth Sentinels’ mission? Did the plot have twists and turns? Could you put the book down? Are you excited to tell a friend about it? What was your initial reaction to the book? Did it hook you immediately, or take some time to get into? How did you feel about the characters? Which ones do you like or not like, and why? Which character did you relate to the most, and what is it about them that you connect with? Did the characters seem real and believable? Can you relate to their predicaments? To what extent do they remind you of yourself or someone you know? How did the characters change or evolve throughout the course of the story? What events trigger such changes? Did the events in the book reveal evidence of the author’s world view? Do certain parts of the book make you uncomfortable? If so, why do you feel that way? Did this lead to a new understanding or awareness of some aspect of your life you might not have thought about before? Do you like the book? If you read any of the author’s other books, how does this one compare? What moral/ethical choices did the characters make? What do you think of those choices? How would you have chosen differently? How authentic are the cultures represented in the book? Why do you think the author wrote this? What is her most important message? How do you think the characters’ points of view are similar or different from the author’s point of view or background? Are the characters’ actions the result of freedom of choice, destiny or adherence to traditional beliefs? Is there any moral responsibility that was abdicated? Are there any symbols that may have cultural, political or religious reference? e.g. flag, owl, sign of the cross, Destiny Stone and its chest, crystals, inner earth, etc. What tone did the author set with her choice of words? Is it optimistic, pessimistic, prophetic, cautionary, humorous, satirical, venomous, cathartic, other? How do you feel about the ending? Would you have stopped there? 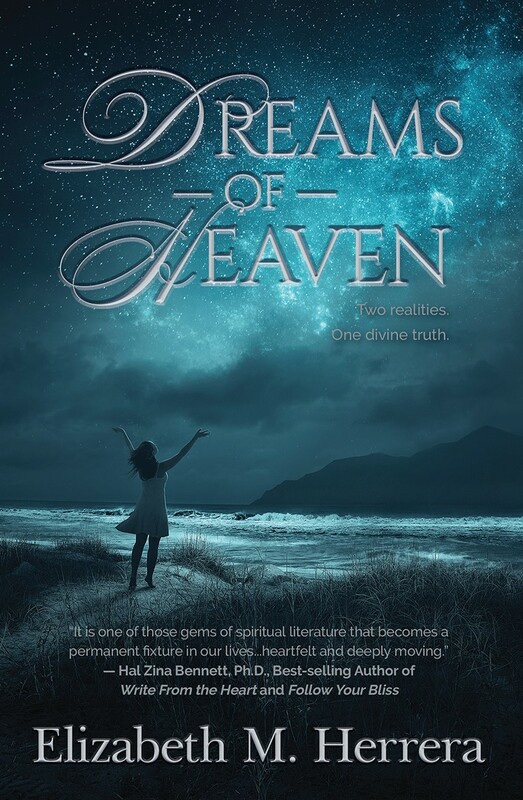 Dreams of Heaven by Elizabeth M. Herrera is an inspirational book that tells a brilliant and heartwarming story, while reflecting on the mysteries of life, love, faith, death, and eternity. Meet Savannah Watkins, a woman just like any other, except that she has very unusual dreams. The recurrent dreams are about the loss of her family in a car accident, so she is caught between the reality of her waking and the trauma of her sleep. As she struggles for answers, Jesus appears and offers to guide her, spending long moments with her along the beach and at the grocer’s. In this sudden yet enlivening contact with the Divine, Watkins discovers the depths of Jesus’ teachings and the answers to the pain of loss that most of us experience at some time in our life. This is an exciting book, filled with wisdom and insight, a story that is both entertaining and inspiring. It starts in the middle of action and the pace picks up from there. It is fast and gripping and I enjoyed how the author managed to keep readers’ curiosity awake and strong through each page of the narrative. Readers will identify with Watkins, a character who is symbolic in that she represents the fears and uncertainties of most readers, living through the desert of faith until the encounter with Jesus. Elizabeth Herrera is a good writer and she has the gift of getting her message across through her storytelling craft. Dreams of Heaven will awaken a new sense of reality in the hearts of readers and the dream of what makes life worth living. Dreams Of Heaven by Elizabeth Herrera is an absolutely beautiful Christian fantasy novel, that really ‘spoke’ to my heart. The novel has Jesus at the centre. He is always with us. There is nothing in this life (or death) that we ever have to face without Him. He will always support us, carry us and love us. He is the embodiment of love. The love just radiates from the story. The love of a mother for her family and her love for Jesus. This love extends to the reader. I felt myself awash with love and with peace. Dreams Of Heaven is simply beautiful. It will soothe your soul. It will speak to your heart. It will fill you with hope. In its simplicity, Dreams Of Heaven penetrates your very being. I loved it. Refresh your life and read Dreams Of Heaven today. The day the world changed forever seemed like an ordinary day in the heart of the Amazon jungle. A handful of tribesmen stood beside the slow-moving mossy-green river enjoying a day of fishing. Takwa, who was considered the tribe’s best hunter, brought a gourd to his mouth, taking a long guzzle of the fermented brew contained within. The colorful feathers in his hair hung back. Red-and-black lines were painted on his bare chest and arms. After quenching his thirst, he let out a satisfied sigh, passing the coveted beverage to the man next to him. All of the tribesmen stared at the strange flying beast. They didn’t often see a jumbo airliner this far from civilization. Standing among them was a young man named Zachary, who was notably different from the others—tall and lanky with sandy-blond hair, and fair skin that was perpetually sunburned. He had no painted lines on his body, and instead of a loincloth, he wore cut-off jeans and a ragged t-shirt with a Pittsburgh Steelers logo on it. He put his hand to his forehead to shield his green eyes from the sun as he gazed at the plane. He frowned because he knew the exhaust fumes weren’t normal. The pearly sheen of the far-reaching trail made it obvious that something was amiss—at least to him. Farther from the shore, wandering alone through the scrub was the tribe’s shaman, Pahtia, an older man with gray hair who was searching for the herb Pau D’arco, which, when found, would be cut and dried, then used at a later date as a remedy for warding off infections. He was also searching for the Chanca Piedra plant, which offered pain-relief qualities, but he stopped his quest when he noticed his fellow tribesmen staring at the sky. Curious, he hobbled through the underbrush, making his way to the riverbank where the jungle canopy gave way to the open skies. Zachary overheard his father-in-law’s comment and felt he was right. But, at that moment, a fish nibbled on his bait. The young man needed to react quickly, otherwise, the catch would be lost. He jerked on the line, swiftly sinking the hook into the mouth of an impressive-sized Pacu—one of the best-tasting fish in the Amazon. The fish fought for its life, wriggling out of the water, shimmering in the sunlight before plunging back into the depths. The other men salivated at the thought of roasting the delicious Pacu, wrapped in banana leaves, over an open fire. “Careful!” one of the men shouted. “Not too fast,” another advised. But Zachary resisted. It was his fish. The hunter gave up, but stood nearby, disgruntled. The Pacu flipped and flopped, desperate to free itself, causing the line to spin off the stick that served as the fishing pole. Zachary rewound the line, trying to exhaust the fish. His amateurish technique frustrated the other men. The stakes were raised when a fourteen-foot Black Caiman, one of the largest members of the crocodilian family, noticed the commotion. The prehistoric creature slid into the river, gliding toward an easy meal. This predator was the perfect killing machine. It had armored skin, a mouth full of jagged teeth, and clear lenses that protected its eyes when attacking its prey. It was also incredibly fast when it wanted to be. And although caimans, like alligators and crocodiles, were not usually a threat to grown men, preferring smaller game and fish, one could never be too careful so Zachary kept an eye on the encroaching beast as well as his fish. Sweat ran down Zachary’s forehead. Too fast, too slow. He tightened the line. The caiman swished its tail more vigorously, closing the gap, its primordial eyes and ridged spine cutting through the rippling waters. The tribesmen knew the caiman would attack from below. Zachary yanked the line, causing it to cut into his fingers. The fish flew into the air, bounding toward the shore. Everyone’s eyes followed the glistening Pacu. The line slackened as it soared. And as it did, Zachary envisioned being the one to bring in the prize catch of the day. However, his dreams of grandeur died a quick death when the caiman lunged out of the water, opening its tooth-riddled jaws, consuming the entire fish and cutting the line before splashing back into the river. “You will never fit in,” Takwa jeered. Zachary hung his head low with indignation. He hated relying on Pahtia for anything, but it was better than staying here among the other men. Takwa’s contempt was obvious even with his back toward him. Pahtia shuffled along, his staff steadying his gait as he led Zachary down a narrow path that wandered through dense foliage, tangled vines and ancient trees, heading toward his hut on the outskirts of the village. Few tribe members visited the shaman there. Most only came to see him when they were sick or needed guidance. His powers scared them a bit. After all, if he had the power to heal, didn’t he also have the power to make them sick? Or worse? But this arrangement suited Pahtia just fine. He was happiest away from the others. He liked being undisturbed while hunting for herbs or journeying to the spirit realm. He knew that one could only clearly hear the spirits’ voices when the mind was quiet. As the two of them neared their destination, a flock of blue-headed parrots scattered. From an overhead branch, a toucan studied them, its observant button eyes peering past its enormous black-tipped orange beak. Squirrel monkeys, hidden in the trees, hooted. The shaman’s thatched-roof hut came into view. Its walls were made out of bamboo slats spaced evenly apart. The gaps let the breezes flow through. They also allowed Pahtia to detect if anyone was approaching, yet still gave him some measure of privacy. Inside, dried wild flowers, roots and herbs were tacked to the slats while others hung from the ceiling. Some fresh gatherings were spread across the worktable. Pahtia instructed Zachary to sit near the ash-filled fire pit that he often used for cooking and simmering medicinal concoctions, then he walked to the back of the hut where he rummaged through his assorted botanicals, selecting a few leaves and roots, placing them in a stone bowl. He added a splash of chicha, then began grinding the ingredients together. The old man stopped mixing, looking up. Deep creases surrounded his eyes. Pahtia shook his head. “He holds a darkness in his heart.” He tapped his chest to emphasize his point. “I know.” The shaman walked toward Zachary carrying the stone bowl. He sat down to finish mixing the compound. Zachary sighed. “Yes, I know.” He hated being treated like a complete idiot. Pahtia shaped the clump into a ball, casually mentioning, “When I die, I will shapeshift into a great caiman.” His eyes gleamed as he imagined reincarnating as this noble reptile. “Maybe next time, I will take your fish.” He let out a rare chuckle, annoying his son-in-law, and then hummed while applying the fresh salve to the young man’s injured fingers. Too embarrassed to return to the river, Zachary went home to his wife, Conchita, who stood in their hut cradling their infant son. Her long black hair hung over part of her face as she gazed down at the baby while singing a traditional lullaby. The moment Zachary saw her, he forgot all about the failed fishing incident. “Oh, it’s nothing,” he said, wanting to forget the whole thing. “Let me see it,” she insisted. He reluctantly held out his injured hand for inspection by the shaman’s daughter. She pointed out the doorway at the sunlit center of the village where the young children were having fun with a Capuchin monkey that jumped from one child’s shoulder to the next, playing a game of catch-me-if-you-can. Four-year-old Eva ran toward the scampering rascal with her hands outstretched, only to have the monkey leap over her sun-bleached curls, landing on top of another child’s shoulder. The children squealed with delight. Zachary laughed at their antics until he glanced up at the sky. Remnants of the shimmering plane trail still lingered. Zachary decided to shake off his worries. After all, what could he do about the plane trail? So instead of answering Conchita’s question, he smiled, brushing her long hair away from her face, kissing her neck, softly saying, “Nothing’s wrong. Sit with me.” He sat down on the palm leaves that covered the floor, patting them with his uninjured hand to encourage her to join him. Conchita handed her husband the baby, which he gently held in his arms, then settled beside him. She gave her son a quick peck on the forehead to assure him that she was still nearby. The infant gurgled with elation. It was times like this that Zachary remembered why he had come here. During the night, Pahtia hobbled through the rainforest using his staff to steady his step. In his other hand, he held a burning torch to light the way. The moon and stars were hidden behind the dark storm clouds forming over the jungle’s canopy. Thunder pounded in the distance, causing the old shaman to quicken his step. He made his way across the quiet village where everyone was safely tucked inside their huts, sound asleep. She stirred, but did not wake. He held onto the doorframe, poking his staff through the gate, nudging his daughter. She drowsily got up, quietly opening the gate, stepping outside, careful not to disturb her loved ones. Pahtia stopped walking and looked back at her. The shaman solemnly responded, “I have something to share with you. But it must be tonight.” He continued along the path. Lightning crackled, flashing through the trees. Against her better judgment, Conchita followed him. “Why not morning?” she asked, her voice nearly drowned out by the rolling thunder. They reached Pahtia’s hut. The flames in the fire pit burned brightly, welcoming them home. Conchita sat near the fire in her usual spot, combing her windswept hair with her fingers while observing the storm brewing outside, its ardent breath huffed through the hut’s slatted walls. Conchita lowered her head to accept the gift. It was a great honor to be declared a shaman. She looked down at the amulet that rested against her chest, picking it up, holding it between her fingers, still not believing the shiny stone her father had worn since she was a child was now hers. He opened the medicine pouch’s drawstrings, reaching inside to take out an amethyst cluster. He held it up between his bony fingers. “This has magical powers. Hold out your hand.” He placed it securely in her palm. “This stone holds the vibrations of Mother Earth. Keep it safe.” He pulled out a jaguar’s curved claw. “Not Taslia,” he clarified, referring to his totem animal, which also happened to be a jaguar. “This was my first kill. I was brave and used only a spear. Very dangerous. Very strong energy.” He handed it to Conchita before he once more dug into his bag, removing a plant root. “This is a wise root. It knows the secrets of the rainforest.” Pahtia placed it in Conchita’s hand beside the other sacred articles. Next, he extracted a human tooth, staring at it as if he was remembering how he acquired it so many years ago, then, without an explanation, he returned it to the pouch. His harsh tone made Conchita regret coming here. Outside, the storm unleashed its heavy rains. “Good. Let me get the herb.” The shaman used his staff to stand up, stiffly hobbling across the floor. Conchita noticed for the first time how much her father had aged. His frame was frail, and his hair was almost entirely gray. She looked away before he returned. Pahtia sat beside his daughter once more. He said a prayer while bringing the herb close to his face, honoring it before dropping the sacred leaves into the fire. Smoke burst out of the flames, billowing all around them. The pair closed their eyes, breathing deeply, letting the smoke fill their lungs. A moment later, from out of the storm, an ethereal black jaguar padded through the doorway, entering the smoke-filled hut. The ghostly feline stood there swishing her tail, her golden eyes reflecting the flames. The totem animal contained the archetypal powers of strength and courage—attributes that would help Pahtia face the dangers encroaching upon him and his tribe. Pahtia’s spirit rose out of his body and climbed onto the jaguar’s back. Conchita’s spirit joined her father’s, sitting behind him. The big cat carried the pair out of the hut, entering the mystical realm of the jungle. Rain dripped from the shadowy leaves as they moved through the trees. Conchita held tightly onto her father. Even if they weren’t in mortal danger, she knew they were surrounded by spirits—most were benevolent, but some were malicious. Pahtia, on the other hand, was enjoying the ride as if it might be his last, listening to the jungle sounds and taking in the sights. He breathed deeply, smelling the humus aroma the rain brought to the surface. The faint sensation of wet leaves dragging across his face and exposed arms didn’t irritate him as it normally would have, instead the cold austere contact made him feel alive. They moved through a blanket of fog, and the rain stopped. The totem animal strolled out of the trees. In front of them was a roaring waterfall. The cascading water reflected the moonlight as it fell into an ebony lake. Maka stopped speaking. Her body glowed brighter and brighter until she was lost in the brilliance, splintering into a thousand sparkling lights, dissipating into the night.